The minarets of Alexandria shone distantly as a British expeditionary force headed for the fabled city. A French counterattack was soon under way. It was a spectacle never to be forgotten by those few who were lucky enough to witness it. The first wave of a British expeditionary force was landing in Egypt, row after row of bristling boats propelled by strong-armed bluejackets whose oars rose and fell with perfect rhythm. It was dawn on the morning of March 8, 1801, and although the weather was clearing, the seas were still rough from a week of storms. In spite of the choppy waters, each boat was placed at a 50-yard interval from its neighbors, and the front of the little armada stretched for more than a mile. Fifty redcoats were packed into each boat, sitting on the small benches with their unloaded Brown Bess muskets balanced between their knees. Each soldier wore a red tunic faced with regiment colors and sported a new type of military headgear unlike the felt cocked hats they were used to wearing. The new hat, called a shako, was a black leather “stovepipe” with a metal regimental plate in the front. Each man carried 60 rounds of ammunition in his cartridge box, two spare flints and three days’ worth of rations in his knapsack. Behind the first and second wave of boats, a third line was towing launches filled with artillery. The French soldiers who waited along the sandy shore of Aboukir Bay were battle- tested veterans, men accustomed to victory under a rising young general named Napoleon Bonaparte. But much of that glory had literally departed when Bonaparte abandoned his men in North Africa and returned to France. They still had their pride, however, and the British were traditional enemies. Twelve-pounder cannons and 12-inch mortars were primed and ready to give the hated English a fiery welcome. When the first line of boats came into range, a French cannon roared, sending a lethal spray of grapeshot over the bay. Soon, other French artillery joined in the symphony of carnage. The battle for control of Egypt had begun. Lt. Gen. Sir John Moore, second-in-command at Alexandria. Painting by Thomas Lawrence. Great Britain had been at war with revolutionary France for nearly 10 years, a decade marked by embarrassing miscalculations and outright failures. It had taken the British cabinet a long time to realize it was dealing with a new force in European affairs. France was not the inept monarchy of yore, but a bustling new nation galvanized with revolutionary zeal. British Prime Minister William Pitt was a shrewd politician but a mediocre war leader. His emphasis was on protecting the nation’s foreign trade and colonial empire—worthy goals in themselves, but goals that had been carried out in a poorly conceived fashion. One of Pitt’s major objectives was to seize the French colonies in the West Indies. The British had achieved some success, but at an appalling cost. The Caribbean “sugar islands” were notorious for being “the white man’s grave,” an inhospitable place where yellow fever and other tropical maladies claimed more casualties than enemy gunshots. The British Army, in particular, had been decimated by Pitt’s wrongheaded West Indian policy. An estimated 40,000 soldiers had died of various tropical diseases, and thousands of survivors—officers and men alike—had seen their health permanently impaired. The West Indian fiasco was just the latest entry on a long list of woes. The British Army was at a nadir in the 1790s, still trying to recover from the psychological blow it had suffered from its surprising defeat in the American Revolution. The debacle in America was only part of the gloomy picture. The largely aristocratic officer corps was riddled by incompetents and cruel martinets. Military thought—what little there was of it—mindlessly worshipped at the altar of Prussian militarism. Using Prussia as the model, the British commanders expected their men to mindlessly obey their puppet-master officers without question. Immaculate uniforms and elaborate parade ground drill became more important than the basics of real soldiering. The British infantry was a decidedly mixed lot, comprised of mostly working class poor and farm boys leavened with petty criminals and other dregs of society. Properly trained and led, they were the finest fighting troops in the world, but by the 1790s, the basic ingredients for such success were sadly lacking. The British Army was also poorly served by an overly bureaucratic supply and transport system. During the abortive Flanders campaign of 1794, ragged, cold and starving troops had lacked everything—even proper artillery support. Arthur Wellesley, later to become famous as “the Iron Duke” of Wellington, recalled that the incompetent campaign was a lesson in “what not to do.” The victories of Britain’s Royal Navy provided the only bright spot in the ongoing litany of gloom. Great Britain’s “wooden wall” had effectively prevented the French from mounting an invasion of the home island. But sea power alone could not win a war. The British Army needed to find a way to redeem itself and wipe away years of failure and frustration. Napoleon’s invasion of Egypt in 1798 provided just such an opportunity. The French were initially successful, and Napoleon added luster to his growing fame as a military genius. But Egypt was nominally part of the Turkish Ottoman Empire, and French seizure of a Turkish province made Great Britain a natural ally of the sultan. Napoleon did not enjoy his triumph for long. On August 1, 1798, the French fleet was destroyed by Admiral Horatio Nelson at the Battle of the Nile. 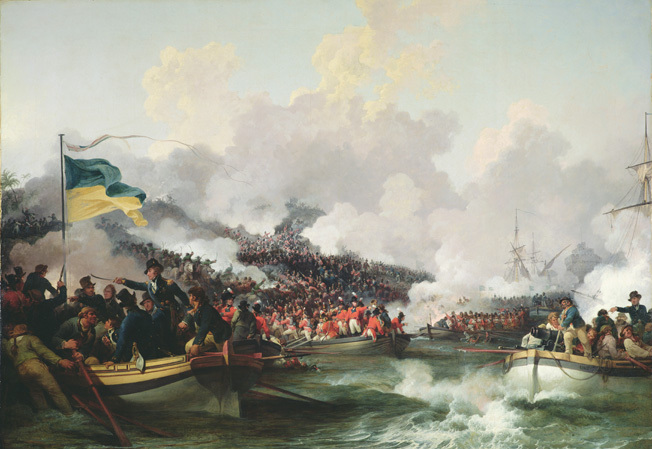 Nelson’s remarkable victory radically altered the larger strategic picture between the two European rivals. The victorious French Army of the Orient suddenly found itself marooned in the Middle East, cut off from France and surrounded by enemies. Napoleon left his stranded army in late 1799 to begin a series of political intrigues back home in France. After a successful coup, he became head of state as First Consul. Beset with a host of European enemies, Napoleon put Egypt low on his list of priorities., providing Great Britain with a golden opportunity to mount a land campaign with a better than even chance of success. Pitt and the cabinet authorized an expedition to expel the French from Egypt in late 1800. In some respects, the British had no choice. A French-occupied Egypt seriously threatened their eastern Mediterranean trade, and strategically—if not literally—speaking, Egypt was halfway to India. The French in Egypt might well encourage anti-British native rulers on the subcontinent. An expeditionary force of some 16,000 men was hastily assembled, and Admiral Lord George Keith was ordered to transport the troops and lend logistical support as needed. From the start, inadequate intelligence plagued the British effort. The leaders in London thought the Army of the Orient was smaller than it actually was. London also counted on Turkish help, but the Ottoman Army had fallen away badly from the glory days of Suleiman the Magnificent in the sixteenth century. The British government was also in something of a quandary about who should head the expedition. The pickings were decidedly slim, but General Sir Ralph Abercromby was given the assignment. At 66, Abercromby was old by late-eighteenth century standards, and he had seen a lifetime of hard campaigning. Soldiering in the tropics had damaged his health, and his eyesight was failing. In spite of all this, Abercromby was still an inspired choice. He may have been half-blind, but his manner of soldiering was anything but myopic. In the West Indies he had earned a reputation for taking good care of his men and treating them like human beings, even within the bounds of military discipline. He forbade drilling in the tropical sun, and dishonest or incompetent officers were sacked, while good soldiers within the rank and file were rewarded conversely. Abercromby was fortunate to have some outstanding subordinates in the upcoming campaign. 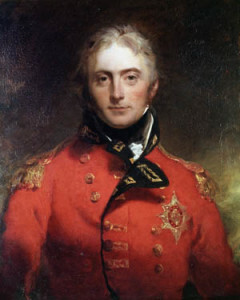 Major General John Moore, a doctor’s son, was free of the pride and prejudices of the aristocratic class. Moore recognized that adequate training in musketry was the key to success. The British Army’s famed “thin red line,” or two ranks deep, could stand against any column—provided that line was trained to shoot two or three rounds a minute and was led by officers whom the men could trust and respect. Moore, like Abercromby, took care of his men, insisting that the soldiers have a sense of personal responsibility as well as discipline. A redcoat was not a mindless doll, but a human being who could think as well as fight. The Egyptian expedition gathered at the island of Malta, which recently had been freed from French occupation, and set sail on December 21, 1800, bound for Marorice Bay in Turkey. The intent was to make contact with Turkish authorities and possibly rendezvous with the Ottoman fleet. Moore had been sent ahead to observe Turkish land forces and make a candid appraisal of their fighting abilities. While doing so, he was regally entertained by the Grand Vizier, a turbaned old man with a white-streaked beard and one eye. The British general was the guest of honor at a 15-course dinner, but nothing could hide Turkish military stupidity. The Turkish Army was mere rabble, with little discipline and less sense of purpose. The British would effectively be left on their own. Weeks went by at Marorice Bay while the British waited for the Turkish fleet to return from Constantinople. The time was well spent, because the troops and sailors practiced the landings they would perform in Egypt. By February 20, however, it was clear that the Turkish fleet was not coming. The expedition set sail for Egypt accompanied by a single Turkish warship. Lookouts sighted the Egyptian coast on March 1, but by this time the weather was turning bad. Seas became so rough and high that an immediate landing was impossible. Instead, Lord Keith did a strange thing—he sailed by Alexandria in full view of the port city, in effect warning the French that the British were on the way. The next seven days were racked with storms and rough seas. The British fleet lay a few miles offshore, its transports packed with thousands of miserable, queasy men eager to get ashore. While they waited for better conditions, Abercromby and Moore took a cutter and went close to shore in an effort to reconnoiter. The best landing place, they determined, was a sandy coastal strip that fronted Aboukir Bay. The landing spot was roughly half-moon in shape and about a mile in length. Aboukir Castle anchored the northern end, a fortification that mounted eight 24 pounders and two 12-inch mortars. The southern end of the half-moon also had a battery, which meant that the British troops wading ashore would be exposed to deadly enfilade fire. In the center the terrain was generally flat, but a sandy ridge rose abruptly not far from the water’s edge. The British noticed some French activity behind the palm-dotted dunes, and it was obvious that they were emplacing still more batteries. The first wave would be hit with fire on three sides, but an attempt had to be made or the whole expedition would be a failure. The storms finally abated on the evening of March 7, and orders were given to prepare for a landing the next day. The British ships were anchored a full five miles from shore, but the sailors were up to the exhausting task. The first line of boats briefly halted just out of gun range to realign itself, but soon forged ahead when the signal was given. 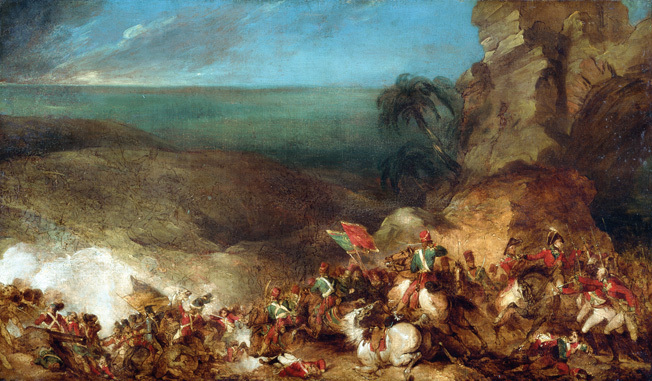 Sabers flashing, French cavalry counterattack the British forces of Alexandria, in this dramatic painting by Sir Robert Kerr Porter, completed later that same year. Instantly, the French batteries sprang to life, as fingers of flame lanced through clouds of dirty gray smoke. French musket balls peppered the British landing boats, and the sea boiled from cannon fire and near misses. Grapeshot tore gaps into the tightly packed ranks of seated men, some of whom fell into the water when they were hit. Two boats filled with Coldstream Guards received direct hits, the blasts instantly turning men into eviscerated chunks of bloodied flesh. The shattered vessels sank at once, only to be replaced by other troop-laden boats following immediately behind. Moore’s reserve brigade was in the forefront, a force that included the 23rd, 28th, 42nd and 58th Foot, as well as four companies of the 40th Foot. Moore and his staff were in a lead barge a bit ahead of the rest of the flotilla. Captain Alexander Cochrane of the Royal Navy was in the same barge, and he was in charge of the overall landing. Each brigade had its own staff boat, carrying the brigade commander, his staff, drummers and color party. Each regiment had a king’s color and regimental color, symbols of its honor and collective spirit. The firing was now heavy, and those men who were not directly hit were drenched by geysers of water from shells striking nearby. The moment Moore’s barge hit the shore, the gallant general scrambled onto the beach and waved his hat in the air to encourage his men. Cochrane did the same, and the men cheered. Within moments other boats reached shore and began to disgorge companies of redcoats. A little farther down the beach, the kilted men of the 92nd Highlanders were having a tough time of it. French dragoons had galloped down to the beach and were sabering the Scottish soldiers as they tried to disembark. The horsemen withdrew when they saw that Moore’s reserve on the far right was pushing forward and might outflank them. Moore and his men faced a steep sandy slope to their front, but scrambled up to the top without hesitation. In some places the slope was so steep that the heavily burdened redcoats were literally on their hands and knees. Once they gained the top, Moore put the men in formation to fire a volley, then led a bayonet change against the 61st Demi-Brigade. Stunned by the sudden turn of events, the French withdrew. They had had a week to prepare shore defenses, yet the British had managed to overcome all obstacles against heavy odds. Moore proudly wrote that the troops had performed with “the greatest intrepidy and coolness.” He added that the British had suffered 600 men dead or wounded. The campaign was not going to be a walkover. 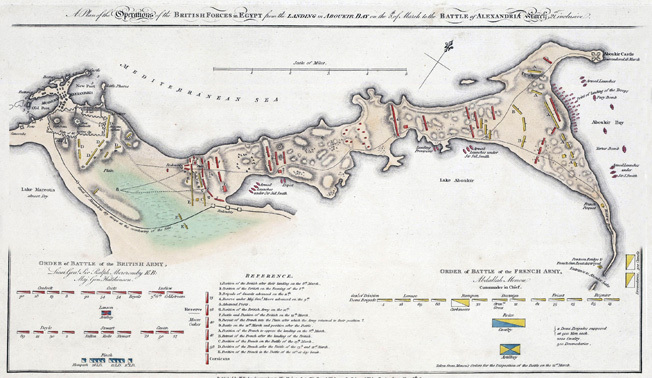 This period map shows the British Progress toward Alexandria, moving from right to left. The redoubt by the sea on the British right is the site of Moore’s repulse of the main French attack. The weary British army moved inland a mile or two before settling in for the night. The men had no tents, and the soldiers had to do the best they could. Abercromby himself slept in a makeshift hut made of date nut palm branches. The night was bitterly cold, with frigid winds coming off the Mediterranean. The Highlanders suffered the most, their kilts providing little protection from the plunging temperatures. Abercromby noted their distress and ordered them given an extra ration of rum. The army stayed the vicinity for four days while ammunition, supplies and guns were brought ashore. The nights were bad enough, but during the day the redcoats suffered from a burning sun and an increasing lack of water. David Robertson, a Highlander from the 92nd Regiment, remembered that some men were so desperate that they tried to “allay their parched throats with salt water.” This tactic only made things worse. Eventually, the British discovered some fresh water springs by simply probing the ground with bayonets, spades and other tools. Fully refreshed, the army started the march to Alexandria, 11 miles away. The redcoats were traveling on a narrow isthmus about a mile wide, with the Mediterranean on the north and Lake Aboukir—not to be confused with Aboukir Bay—to the south. Lead elements of the Expeditionary force spotted a force of some 6,000 French troops just ahead, barring the way. But in the far distance, they could also see Alexandria, its exotic minarets spiking the sky like some fabled city in The Arabian Nights. Their steps quickened. The next few days were relatively quiet, but the calm was more apparent than real. General Jacques–Francois Menou, the French commander-in-chief of the Army of the Orient, had stayed in Cairo when the British landed, and he did little to muster or concentrate his forces. Menou was a true incompetent, and his behavior could only be described as bizarre. When Napoleon was still in Egypt, Menou made a great show of converting to Islam. It fooled no one. His fellow Frenchmen believed that “Abdullah” Menou did not really believe in an Islamic god—he only became a Muslim so that he could marry Zobeida, the beautiful daughter of a local banker. When Menou finally roused himself, he marched north with only 10,000 men, a major mistake. Napoleon probably would have sent every available man and gun to Alexandria. When the tardy French general finally reached the coast, he only had about 12,000 effectives in hand—actually less than his British foes. In the meantime, the British had settled into their new defensive positions, which stretched across the mile-wide isthmus. The French were guarding Alexandria from a fortified ridge about two miles from the British front, and for several days all was fairly quiet. The redcoats quickly adapted to their new environment. Some literally covered themselves with sand to protect them from the cold night air. Local Arabs came into camp to trade, and soon did a brisk business in sheep and ostriches. The Highlanders eagerly brought the feathers for their Scottish bonnets. But Moore had other things than fashion on his mind. The extreme left was a weak point, so he ordered the emplacement of two batteries, as well as another battery near the Guards Battalion in the center of the line. Moore was still not content with the arrangements. A couple more redoubts were added, until there were two 20-pounders and 30 field guns up and down the line. The general knew that his reserve brigade’s position in the extreme right was key to the entire British camp. It was on high ground, and featured the remains of ancient Nicopolis, an Alexandrian suburb that had been built by the Roman emperor Augustus. The whole area was honeycombed with shattered columns and other ruins. Local Arabs warned that the French were about to move, but no one knew when it was going to happen. By chance, Moore was the officer of the day for March 20. He took his responsibilities seriously, remaining awake throughout the night. He was just starting to give orders for the withdrawal of sentries at dawn when firing started on the left. It was 3:30 AM, and so dark that it was hard to distinguish friend from foe. Pinpricks of light sparkled and flashed in the distance, telltale signs that muskets were being discharged, and Moore heard a thunderous noise to the far right. The French probe to the left was just a feint—Moore instinctively knew that his reserve battalion was going to receive the brunt of the French effort. “This is the real attack!” he shouted to an aide and galloped back to his command as fast as his horse could carry him. A near-contemporaneous painting of the Battle of Alexandria by artist Philippe Jacques de Loutherbourg. General Sir Ralph Abercromby, seated center, has suffered a fatal leg wound. When the action began, the Guards Brigade was in the center, supported by three brigades on the left. The British also had a second line consisting of two more brigades and dismounted cavalry. They could take care of themselves—the real developing crisis was on the right. The British had constructed an open redoubt about 20 yards in front of the Roman ruins. The 28th Regiment of Foot (Gloucesters) held the redoubt area, while the 58th Foot occupied the ruins. The 23rd Foot and flank companies of the 40th Foot in turn supported the 58th. Columns of French infantry swept forward in waves, only to be repulsed by the 28th Foot’s disciplined volleys. The French attack receded in a bloody ruin, but this was only the beginning. A second French column swept to the left and penetrated the British line, threatening to take the redoubt from the rear. Opportunely, the 42nd Highlanders arrived on the scene, and Moore personally led the Black Watch forward in a bayonet charge that plowed into the French column’s flank, throwing them into confusion and disorder. Moore was hit in the leg, although not seriously, and the 42nd started to pursue their beaten foes. Their blood was up, and they chased the broken enemy too far. Suddenly the tables were turned—they found themselves facing fresh French cavalry. The Gallic horsemen charged, throwing the kilted Highlanders into disarray, then swept left of the redoubt, making for the British rear. Once the French held the redoubt and the heights, they could roll up the entire British line. The 28th Foot was valiantly holding the redoubt, beating off continued attacks in the front, when suddenly they discovered French horsemen coming up from behind. The British infantrymen were formed in two ranks, the classic “thin red line,” and completely surrounded by the enemy. It was the supreme moment, and the 28th was not found wanting. The rear rank turned as ordered, literally back-to back with their front-facing comrades. They lowered their muskets and delivered a volley that emptied many French saddles. Stunned, the French survivors withdrew. By this time dawn was lightening the eastern sky, revealing the extent of the British victory. The French retreated on all fronts, leaving behind 3,000 killed and wounded. In honor of its heroic stand, the 28th was allowed to wear a cap badge on the back of their shakoes as well as on the front. The Battle of Alexandria, sometimes called the second or night battle of Aboukir, was indeed a great victory, but it had been purchased at a high cost. The British had suffered 1,376 casualties, but it was the loss of their commander-in-chief that was the most keenly felt. General Sir Ralph Abercromby preferred to lead from the front, and at one point he was surrounded by French dragoons attempting to take him captive. One dragoon tried to lay hands on Sir Ralph, but a Highlander corporal shot the French assailant dead. A short time later, however, Abercromby was hit by a musket ball in the thigh. He died a few days later, mourned by all in his command. The rest of the Egyptian campaign was largely an anticlimax. Six more months of hard fighting remained, but after the capture of Alexandria the issue was never really in doubt. In August 1801, Menou surrendered and the French evacuated Egypt. Napoleon’s Egyptian adventure, an uneasy mixture of idealism, cynicism and blood, was over at last. For the British Army, the Egyptian campaign was a new beginning, auguring more victories to come. 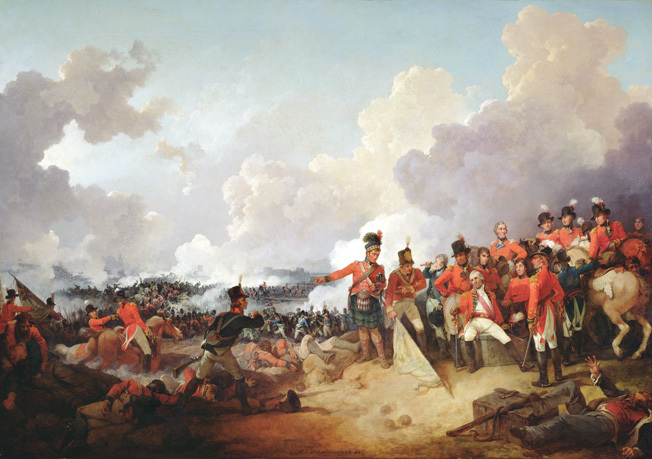 Moore had demonstrated that British battle techniques were sound, and that with proper guidance the British soldier was equal or superior to Napoleon’s vaunted legions. The fighting techniques shown at Alexandria would continue, reaching their zenith on the muddy fields of Waterloo 14 years later, when Napoleon and his Grande Armee were defeated for good. Tags Admiral Lord George Keith, Army of the Orient, Battle of Alexandria, british military history, British Royal Navy, Brown Bess, Constantinople, Egypt, General Jacques Menou, General Sir John Moore, General SirRalph Abercromby, Mediterranean, Napoleon Bonaparte, Napoleonic Wars, Ottoman Empire, Sir Arthur Wellesley, The Duke of Wellington, William Pitt.